Could you provide more information about this 2012 Yamaha ZUMA? Siegfried's Motorwerx LLC is proud to present this 2012 Yamaha Zuma 50CC for sale! This scooter features Yamaha's newest 49CC motor, the 4 stroke liquid cooled powerplant has been proven to be a very reliable motor! We have customers who have gone over 35,000 miles just by following a regular maintenance schedule!!! This scooter is in overal good condtion, it has some small cosmetic flaws but it IS MECHANICALLY VERY SOUND! We have fully serviced this scooter and have gone through to ensure that this one is ready to RIDE! These zuma's are great for the demanding consumer, they have the same go anywhere attitude of the previous Zuma's but the chassis and body work have been updated to meet the needs of the average scooter enthusiast!! 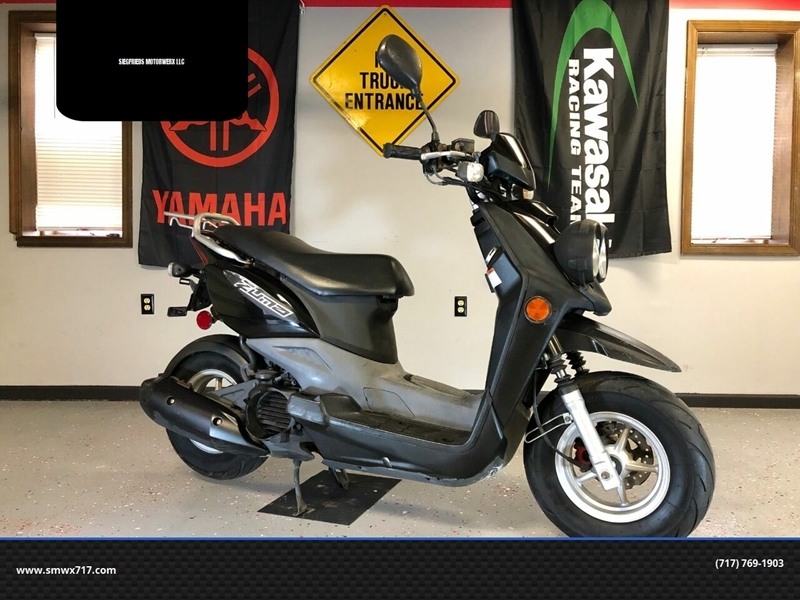 We have a plethora of warranties available for purchase on this scooter! Siegfried’s Motorwerx is more then just a dealership. We are also a full service repair facility for ALL powersports! With labor rates starting at just $45 an hour! We pride ourselves on providing EVERY customer with open communication, HONEST repairs, and a commitment to QUALITY in our work! You can’t go wrong giving us a shot on your next service! Looking for a Motorcycle, scooter, or other powersport product? Contact us today! If we don’t have it, WE CAN GET IT! We have the advantage of being sister companies with a full service vehicle and powersports transportation company! This gives us nationwide buying power at a fraction of the cost! Saving YOU money! We offer service on all makes and models. Harley Davidson, Indian, Yamaha, Honda, Suzuki, Kawasaki, Vespa, Kymco, Piaggo, Polaris, Brp, Can Am, you name it! Wether your passion is in the dirt, on the streets, or out on the water we have you covered. No job is to big or small, we are here for you! From brakes, oil, and tire changes to larger more intricate jobs you can rest easy knowing the jobs being handled by a company who is as passionate about your ride as you are! With access to some of the nations largest parts houses we are able to offer our customers unbeatable prices on all of the top brands! Wether you need your new part installed or are looking to DIY we will do everything we can to give you the best pricing available. Looking for gear? We have that too! Helmets, glasses, gloves, jackets, pants and boots! Almost all of our gear can be available for pickup in your needed size within a few short days! What is the price of the 2012 Yamaha ZUMA you have in your inventory? What is the mileage of the 2012 Yamaha ZUMA you have in your inventory? I was wondering if this 2012 Yamaha ZUMA is still available?